Are you up for a challenge? Do you want to raise money for life-saving mental health research? 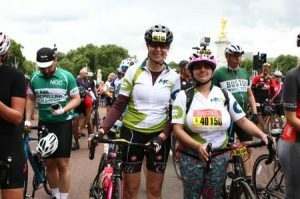 The McPin Foundation has places for RideLondon 2019 and we would love for you to join our team. Over the last four years our riders have raised thousands of pounds to support life-saving mental health research, and had great fun doing it! This year, with your help, we want to raise even more money, and awareness. Apply by downloading and completing our application form and sending it to contact@mcpin.org. Celebrating the legacy for cycling created by the London 2012 Olympic and Paralympic Games, RideLondon starts in Queen Elizabeth Olympic Park, then follows a 100-mile route on closed roads through the capital and into Surrey’s stunning countryside. With a route made famous by the world’s best cyclists at the London 2012 Olympics, it’s a truly spectacular event for all involved. The route then finishes on The Mall in central London. Why ride for the McPin Foundation? Approximately 1 in 4 people in the UK will experience a mental health problem each year, and the number of people who self-harm or have suicidal thoughts is increasing. We are determined to help fund vital mental health research that will save and improve lives. We believe that people affected by mental health problems have valuable and unique expertise that can be utilised in all stages of research to improve its authenticity, relevance and impact. We work hard to make sure our work is transitional, meaning that our research has the potential to influence knowledge, services and policy to improve mental health in communities everywhere. How can we support your RideLondon journey? When you sign up to ride for the McPin Foundation, you become part of a team who are passionate about transforming lives through research. You will be provided with a McPin branded cycling jersey and our support in publicising your fundraising. All money is donated through Virgin Money Giving, an easy-to-use fundraising platform. All we ask is a £50 entrance fee and that you commit to raising a minimum of £500. You will also, of course, need to be ready to put in the training to be able to complete the event. So, what are you waiting for? Download the application form now! If you have any questions, please do contact us at contact@mcpin.org or on 0207 9227877. We promise that every penny you raise will go to funding life-changing mental health research. Our administration costs are covered by the funds we received when the foundation was created.